The Hughes XF-11 experimental twin-engined, twin-boom photo-reconnaissance aircraft, which had contra-rotating propellers, crashed on its maiden flight, seriously injuring Hughes. 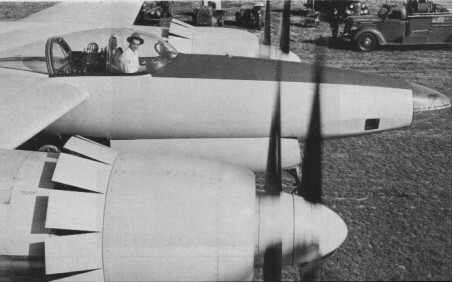 The XF-11 was a candidate for a military contract. On July 7,1946, Hughes took his XF-11 reconnaissance airplane on its first flight. Though photographed in the plane just before the test, he intended the flight to be secret. The contra-rotating props developed problems, and the plane crashed, seriously injuring Hughes. Full power. Release brakes. Rolling. Lifting off. Climbing. Everything perfect. Power reduction. Right props slip into reverse pitch. Fierce asymmetric thrust (one second). Feathering in-op (two seconds). Try to hold heading (three seconds). Back on right, full power on left (four seconds). No good, back on both (five seconds). Crash. On April 15, 1947, Hughes successfully test-flew a second version of the XF-11, this one with single-rotation airscrews, and personally conducted most of the test program.